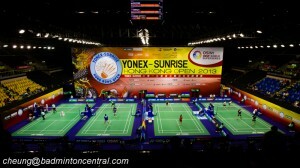 The Super Series tour shifts to Singapore, the rich and modern city state in South East Asia. Since the 1987 inauguration edition, many illutrious shuttlers have tasted victory here such as Misbun Sidek, Yang Yang, Zhao Jianhua, Taufik Hidayat, Zhang Ning, Chen Jin, Lee Chong Wei, Wang Yihan, Ahmad/Natsir, etc. Last year’s edition of Singapore Open ranked 9th for World Best Press Facility by AIPS polling, a proud accomplishment for badminton itself competing with other sports. Looking at the Men’s Singles draw, it’s no less competitive even with the absence of two iconic names, Lin Dan and Lee Chong Wei. A series of current high profile players like Chen Long, Jan O Jorgensen, Srikanth Kidambi, Chou Tien Chen, Son Wan Ho are ready to rock the Singapore Indoor Stadium along together with a string of underdogs. Last year’s winner, Simon Santoso must start his campaign from qualification once again due to his low world ranking. Both Carolina Marin and Li Xuerui skip this event, followed by Saina Nehwal latest pulling out but the Ladies Singles discipline still has strong line-up; China’s two Wangs, Shixian and Yihan, Tai Tzu Ying, Ratchanok Intanon, Korean duo Sung Ji Hyun-Bae Yeon Ju also Japanese talented stars Akane Yamaguchi and Nozomi Okuhara will spice up the competition from the early rounds. Last Sunday’s final painful loss for world #1 Lee Yong Dae/Yoo Yeon Seong in teh Malaysian Open may be redeemed in Singapore. Barring any upsets, the formidable Korean pair is slated to meet their nemesis Ahsan/Setiawan in last round. Some combinations who will trouble both top contenders are Endo/Hayakawa, Ivanov/Sozonov, Conrad/Kolding, Fu/ZHang, Lee/Tsai, Chai/Hong. Defending champions Cai Yun/Lu Kai have their hands full attempting to repeat their 2014 achievement. It’s busy period as some shuttlers are now participating in their third Superseries in three weeks including Japanese leading ladies doubles, Matsutomo/Takahashi and Kakiiwa/Maeda. They will face stiff challenges from Chinese and Korean new scratch ladies doubles pairs who started their experiment last week; Chang YN/Jung KE delivered a positive note to manage second position in KL. We see the first debut of Huang Yaqiong/Ma Jin. Double’s specialist Ma Jin has recently concentrated on Mixed Doubles as the last time she played Ladies Doubles was the French Super Series last November paired up with Tang Yuanting. Fischer/Pedersen and Liu Cheng/Bao Yixin are the notable absentee in the Mixed Doubles division as almost all Malaysian Super Series Premier have flown directly to Singapore. As usual two China premium pairs, Zhang/Zhao and Xu/Ma plus 2014 champion Ahmad/Natsir will be the pairs to beat. The last withdrawals in main draw according to latest ts.com updated : Tommy Sugiarto (INA), Sho Sasaki (JPN), Saina Nehwal (IND), Michelle Li (CAN), P.V. Sindhu (IND), Sudket/Saralee (THA).